I see life more of an assorted box of biscuits than chocolates. Best served with plenty of tea breaks and a chocolate biscuit to dunk! 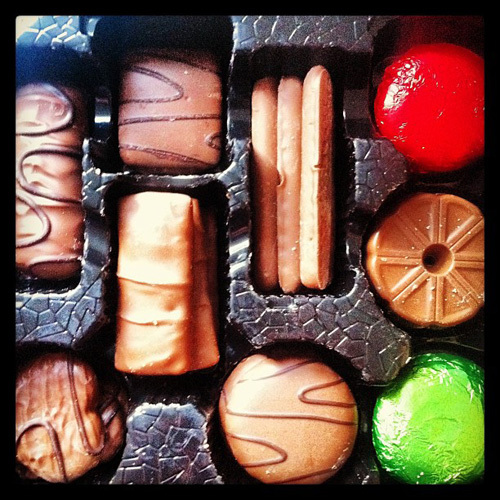 The assorted colours and flavours of the biscuit tray bring up a range of expressions and emotions. Their shape and colourful wrappers, flavours and taste makes me warm, yet happy when I finally get to dunk the chunky fella into my cuppa tea! It’s ME time. I love being part of projects that helps me to ‘enjoy the little things‘ – making life interesting and meaningful. Don’t we all wish we could make time to do more creative things, to learn new skills and experiences? Most of us feel like our days are filled with work and family commitments, or as if we’re on a never ending production line and waiting for someone to hit the pause button. But with only just four more days left until the end of the year, go on, open up that box of biscuits from Aunt ________ (insert name) and think of all those life goals you’ll be achieving in 2013, jot them all in a notebook whilst dunking that biscuit into your Yorkshire tea. Nice.